RZA – Flying Birds. I think this was a secret instrumental on a soundtrack. I mean come on, it’s the RZA. It’s short, but you’ll like it. Exile – Move On Em. I like this song – and it seems that Ta’raach did too, since he spit over it on his latest album. soundincolor.com Oh PS – Jon, where’s that mix? Fat Jon the Ample Soul Physician – You Are. This is an old joint off of Lightweight Heavy. Really the whole album is worth owning, and if you dig this cut, I’d recommend doing some research and finding more of this cat’s work. And that’s it for this week. Again, if you have a moment, be sure to drop a comment to let me (and the artists) know how people are feeling the show, and the material. This entry was posted in episodes and tagged beattape, chicago, count bass d, daz-i-kue, earmint, episodes, ev productions, exile, fat jon, herbie hancock, instrumentals, j dilla, kenny keys, mathematics, mumbles, nature sounds, rza, sound in color, suburb, wu-tang by dex digital. Bookmark the permalink. You are the dude man! Thank’s for the support dude. I still hip people to the show…. It was dope catching you in N.Y. I was so beat dude….I was reacting slow to everything, Ha! I will be hitting you off soon G.
I found your site through Wikipedia’s mixtape reference. DAMN- kid, you’re killing it with your eclectic sounds and indepth webspace!!! I am envious of your technique; I definitely need to step my game up! Kenny – where them joints you were telling me about? 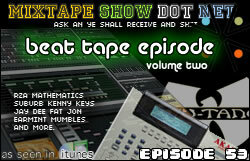 I still got one of those exclusives on deck for a future episode..
Tech – Appreciated. Feel free to search around – there’s a little over 26 hours of music and counting up here..
Good lord – this is probably my favorite episode yet. The instro’s on this are crazy and that Exile joint is heavy. I am definitely gonna have to look into that Kenny Keys dude too. Thanks for the music – no other way to say it. leigh – yo, thanks! – if you dug this one, you might like the others in the series. People seem to dig Beat Tape Vol 3. And that reminds me – I need to get at Kenny Keys, haven’t heard from him in a minute! I do know that Eulorhythmics is working on a new album, and they’ve got some crazy guest features I won’t mention here..
That RZA cut is off of the Ghost Dog OST, the one that only got released in Japan, not the ‘extra tracks lying around’ LP. You can find it out there among the internets, it’s hot as hell. Fresh mixes you got in here, god. But I got a problem, wonder if you could help me. I�m going 2 preform with the Exile Move On Em beat in 1 week. Only problem is the quality aint that good. Do u have the beat in better quality? If you do i would APPRICIATE if u could send me it, upload it or watever.